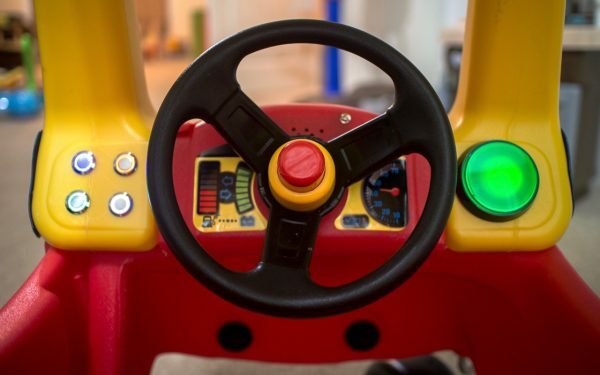 Little Tikes Cozy Coupe #Arduino and WaveShield Retrofit #ArduinoMonday « Adafruit Industries – Makers, hackers, artists, designers and engineers! This wasn’t a particularly difficult project, but it did take a bit of time to set up. The overall concept is to create a media controller which plays different sounds or songs depending on the button pressed. I figured I could replace the toy key with a giant button and also fill the blank space on the left with some buttons to select the music. The music player is an Arduino Uno and Wave Shield. The shield is an affordable addition to the Arduino Uno microcontroller that allows it to play uncompressed audio files of any length. It’s very convenient for the purposes of this project since it reads WAV files off of a standard SD card and outputs it all to a 3.5mm jack. It also leaves enough input ports for the buttons to be attached later on.